The Simmons Beautyrest Infant and Toddler Mattress features luxury pocketed coil springs and innofoam corner protectors. Built with two distinct sides that cater to both infants and toddlers, this mattress is GREENGUARD Gold and CertiPUR-US certified, and helps create a healthy and comfortable sleep space for years to come. The Simmons Pampering Nights 2 in 1 Infant Mattress M58984-3146 has many exciting features for users of all types. See the Simmons Pampering Nights 2 in 1 Infant Mattress M58984-3146 gallery images above for more product views. 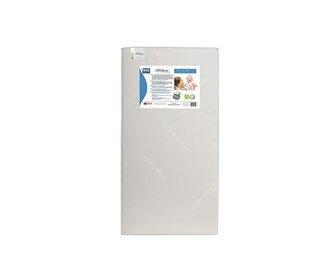 The Simmons Pampering Nights 2 in 1 Infant Mattress M58984-3146 is sold as a Brand New Unopened Item.